Some of you have asked me about the significance of the newsletter’s name. The name, for me, evokes a feeling and concept that many of our homes already have built into them – the front porch. The front porch can be the equivalent of an outdoor sitting room, a place for discussion and relaxation. As I walk the streets of our neighborhood I see people barbequing, reading, playing with their children, writing and even conducting business on their front porches. I might catch folks just sitting, gazing at the street or in the trees, entertained by a bird or squirrel. The front porch welcomes the passer-by. It invites conversation between neighbors. Between the rise of the front porch in the middle nineteenth century and its decline in the post World War II era, the front porch developed a cultural significance. It represented the cultural ideals of family, community, and nature. Some of our friends who live in the “burbs” lament, “Our neighbors just open their garage, pull in, and you never see them. Or, “Everyone hides out in their backyard.” And, “We still don’t know many people on our street, after all these years.” What might be missing from these homes is a front porch—or at least a “front porch attitude.” Granted, this home feature can’t guarantee a gregarious disposition in life or an abundance of open, friendly neighbors, But it is a start. Why do you think the street side cafés and coffee shops with outdoor seating are so popular? They have, in a sense, replaced the front porches. 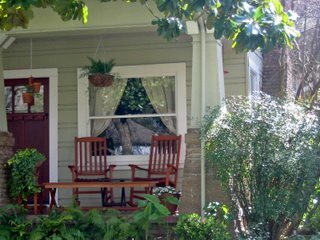 Is your front porch lying dormant? You may not be the one who throws a block party or makes friends with everyone on your street. But how about this for a modest start at getting to know your neighbors? Dust off those beautiful Adirondack chairs (or just a folding chair will do) and become a part of the front porch culture in our neighborhood. While my day job consists of real estate investing, consultation, and property management, I’m also striving to help draw our neighborhood together. So, whether you have one or not, you can still enjoy the ethos and attitude of the front porch. See you soon … on the front porch.